Chord Epic speaker cable is the result of a successful marriage of two of our award winning speaker cables. The silver-plated oxygen free copper conductors, PTFE insulation and silicone surround are borrowed from Chord Odyssey speaker cable and the shielding system is taken from the Chord Signature speaker cable. The development and success of Signature speaker cable proved conclusively that shielding speaker cable could bring some serious improvements to sound quality. The lessons learned during its development means that we can now apply the same principles to other cables within the Chord range. Chord Epic is a highly effective shielded cable with many of the performance characteristics of the more expensive Chord Signature. Fitting shielding systems to speaker cables can bring the same sort of benefits to the sound of a system that improving the shields on interconnects does. The reduction and the level of perceived noise means that very fine dynamic and tonal information is easily heard and brings improvements not only to the high frequency performance of a system, but also the bass and mid frequencies. The space around notes and the extra harmonic content that Epic can bring to a system is really surprising. The complex harmonic information that makes up the timbre of stringed and bowed instruments is carried extremely accurately. The lower noise floor also makes micro dynamic information easier to hear and it is simpler to follow, understand and become more involved with, even the most complex pieces of music. 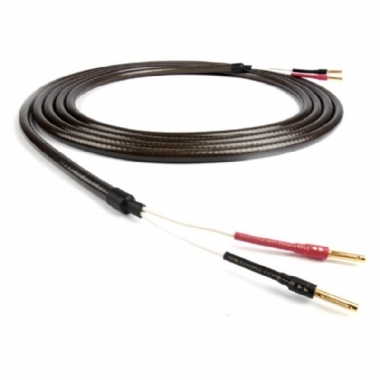 All speaker cables priced per metre unless stated otherwise, Termination and plugs extra.